I couldn't decide what to put in the personalization section of the sampler. I stitched and restitched it about four times. First I was going to do my initials and last name like Cynthia did, but it wouldn't fit and then I was going to do my first name and last initial, but it still wouldn't fit and then I was going to do the date in smaller numbers, but it looked funny. So I think I'm happy with this. I would've had a lot more done if it weren't for my indecision. I love your sunflower banner! Great start! I struggled with the same thing this last weekend. Stitched and restitched the personalized section of a project that was otherwise finished. But finally got it. Yours look great and lots of fun stash. 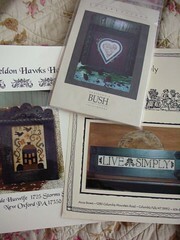 Your sunflower sampler is looking great - I like how you personalized it. 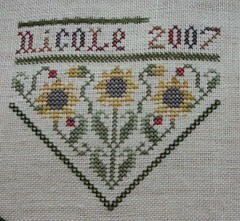 Nice progress on your Sunflower Bellpull Nicole - your personalization works really well. Your Sunflower Bellpull looks great. I like the way you did your name and the year. I love the sunflower sampler and your name and date looks great. I have stitched Sheldon Hawks House and it continues to be one of my all time faves. It was so much fun to stitch. I am looking at it right now actually, b/c I hung it in my office. Not that I'm surfing the web during work or anything.... Ann. 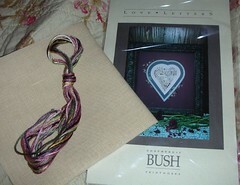 Your personalization looks great - I had the same problem with my RR piece. I spent more time messing with my name than anything else! I am glad the ladies were nice to you when you went back. Great stash...I love the SB piece!